Many years ago our intrepid plant explorer, Joseph Simcox, was given some impressive cowpeas from Madagascar. 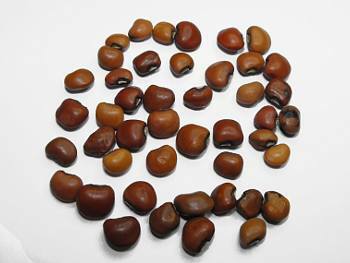 The shape was almost round and somewhat flat, a shape that was completely different from that of almost all other cowpeas. Years later when driving on a desolate road in southwest Madagascar he came upon the same distinctively shaped seeds. This unique form is only found in Madagascar, and where it came from, or how it first came to be, is still a mystery. The centre of biodiversity for cowpeas is in Zambia and Zimbabwe, so cowpeas probably came from there. But after centuries of cultivation on the island of Madagascar, the worlds fourth largest, it seems that this form developed in relative isolation from the rest of the world. As Joe says, this is a really cool bean to grow and share with friends.